Nowadays, the digital economy plays a significant role in economic life. It is determined by the intensive development of modern ICT (Information and Communication Technology). Thus, the importance of the information society using techniques of information communication and processing that arose from the connection of other households is increasing. These households participate and form the basis for the process of creating social capital. Therefore, it seems interesting to examine the socio-economic space of Polish households due to the existence of disproportions in ICT development. 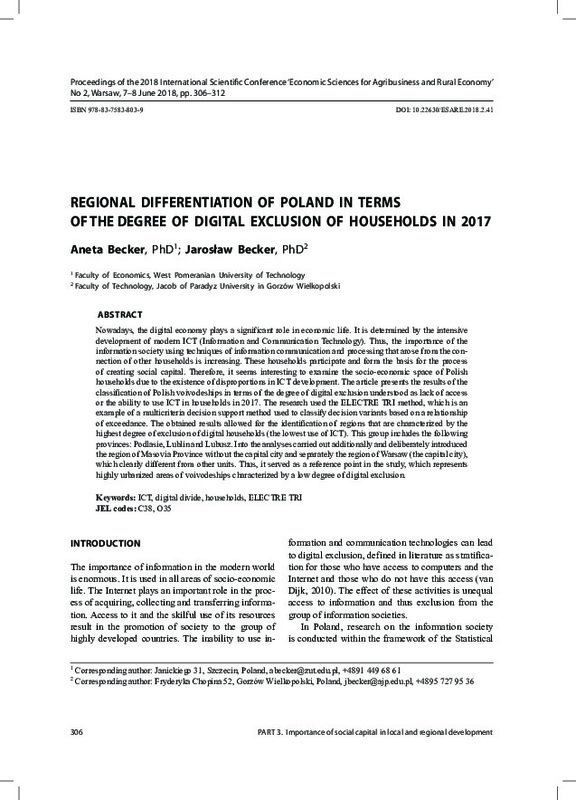 The article presents the results of the classification of Polish voivodeships in terms of the degree of digital exclusion understood as lack of access or the ability to use ICT in households in 2017. The research used the ELECTRE TRI method, which is an example of a multicriteria decision support method used to classify decision variants based on a relationship of exceedance. The obtained results allowed for the identification of regions that are characterized by the highest degree of exclusion of digital households (the lowest use of ICT). This group includes the following provinces: Podlasie, Lublin and Lubusz. Into the analyses carried out additionally and deliberately introduced the region of Masovia Province without the capital city and separately the region of Warsaw (the capital city), which clearly different from other units. Thus, it served as a reference point in the study, which represents highly urbanized areas of voivodeships characterized by a low degree of digital exclusion.